We often hear that one of the most special things about NYU is its location in New York City. The school’s setting, we are told, gives students access to a wealth of resources, cultures, and opportunities that can’t be found anywhere else. Through New York-related classes and projects, Prof. Thomas Augst seeks to strengthen this tie between the university and its urban home, and even encourage students to produce new knowledge about life in the city. In “Urban Atlas,” Prof. August’s students study the representation of urban space and experience in works by nineteenth-century American authors like Walt Whitman and Herman Melville. The class is project-based and is open to non-English majors who hope to bring their experiences in their various majors into this interdisciplinary course. Students learn to ask questions about how literary texts orient us to place and about the importance of setting and geography to the story. 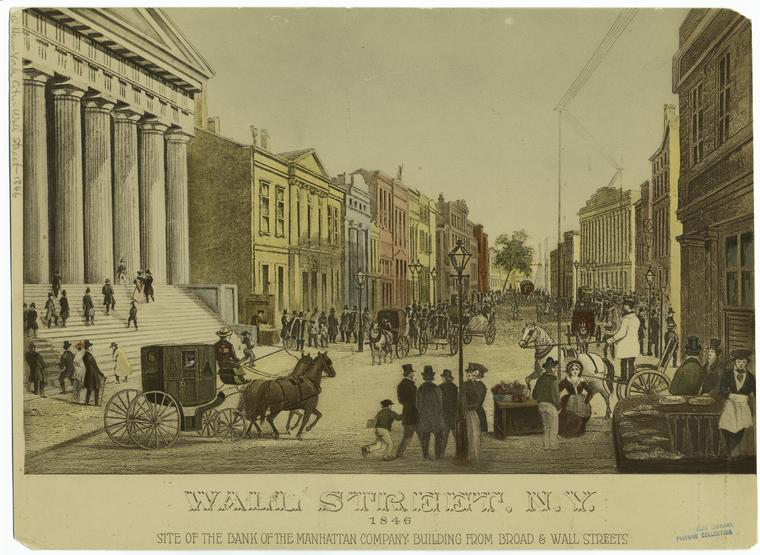 Using the digital tool Story Map Journal, they create maps of nineteenth-century New York with different layers that show and explore places in the works they read. This semester, the focus was on Herman Melville’s short story “Bartleby, the Scrivener.” Each student creates an independent project that he or she then uses to explore census data, public health statistics, and other relevant facts, which have all been entered into Story Map Journal. 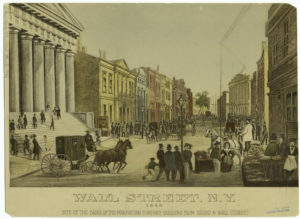 Wall Street, depicted in this 1846 engraving, is the setting for Herman Melville’s 1853 story “Bartleby, the Scrivener.” Melville’s tale is the focus of Prof. Augst’s undergraduate class “Urban Atlas.” Courtesy of the Art and Picture Collection, The New York Public Library Digital Collections. “Writing New York” has a broader temporal focus, but it, too, concentrates on literature that was written in and about New York City. Prof. Bryan Waterman and Prof. Cyrus Patell first developed the course in 2003, and Prof. Augst recently started teaching his own version, concentrating on a variety of works from Ralph Ellison’s The Invisible Man to Patti Smith’s Just Kids to Whitman’s Leaves of Grass. Covering fiction, poetry, drama, performance, and journalism, this survey is more of a traditional English class than “Urban Atlas,” but students still have the option to do independent projects such as research papers or story maps. This emphasis on project-based and place-based learning is one innovation that Prof. Augst brings to the table. He is currently involved in the NewYorkScapes working group, a research community that applies digital methods and tools to urban cultures and landscapes and works to bring together all types of scholarship in the study of New York City. The NewYorkScapes website features projects, personal profiles, and event pages that will help researchers connect with one another and learn about each other’s work. You can read more about the group here, in Louisa Brady’s recent English Department spotlight. So why do all roads lead to New York City? As Prof. Augst told me, it is a microcosm for the development of culture and literature in the United States. The most exceptional thing about it is its scale and the millions of stories it manages to encompass within just 305 square miles. By studying the city’s literature and history, we can add to our existing knowledge of its inner workings and therefore give back by understanding our urban home more thoroughly. In doing so, the city becomes for us not only the setting for a book or a short story but a character in itself that is as nuanced and researchable as Jay Gatsby or Holden Caulfield. Its streets can be mapped and read, its sidewalks paved with words, and its stories studied by all.